This is connecting point with Pastor Wayne Cordeiro. Wayne: Aloha and welcome to Connecting Point. I’m Wayne Cordeiro. Kim: And I’m Kim Harper. Wayne: You know there are some people who want to go back to Hawaiian culture and religion. But what was the religion of the original native Hawaiians? Kim: Was it the traditions of Pele and human sacrifices? Wayne: With us today is respected scholar Daniel Kikawa and Kawika Kawiapo, two of the founders of Aloha Ke Akua Ministries. Kim: They will tell us what they believe is evidence that the earliest Hawaiians worshipped the God of the Bible. Wayne: Stay with us for another powerful half hour right here on Connecting Point. Wayne: Welcome to this very special edition of Connecting Point. We’re here with Daniel Kikawa of uh, the author of “Perpetuated In Righteousness” and talking about the origins of Hawaii Nei. Also we are here with Kawika Kapiapo, a great musician and also a Kahu/Pastor (Sandy Note: actually pastor in Hawaiian is Kahuna pule). Welcome to Connecting Point Daniel & Kawika. Good to have you here. Now you’ve written in this book “Perpetuated In Righteousness”, now what is this book all about? Daniel: It’s about the Godly origins of the Hawaiian people. You know the Bible says in Romans 1:20 that all people knew Him. So there would be origins of the one benevolent Creator God in Hawaiian history and Hawaiian culture. So we’ve just researched that and documented it. Wayne: Now a lot of people want to go back to the roots, you know, of Hawaii and the old ways, etc. and what’s you’re asserting is that in the beginnings it was really a Christian state. Daniel: Well I wouldn’t say a Christian state in the sense that we know what is called a general revelation of God where we have a general revelation from creation around us, as it says in Romans 1:20. Again that we know Him by creation and the things around so that we are without excuse to know the Creator God is there and He loves us. Now Jesus, He came later on, He had to be born as a man. And so His knowledge had to be brought. But there is a general revelation of the Creator God that every people has. And so it’s there in Hawaiian culture and all we have to do is look for it. A lot of people want to go back to find their roots and we understand that, and where everybody wants to know who they are and be proud of who they are but they have generally gone back to the last Hawaiian village which was there which was actually a foreign religion brought by the priests Pa’au around between 11 and 1300AD. And this one of course had human sacrifice. Thousands of people were sacrificed; a very harsh Kapu system where people, females, were killed for eating a banana, for instance and you know that system was a system that was brought in later. Before that they worshipped the one Creator God. Man was sacred to Him, not to be killed. He was known as the God of love. And I believe this is where “aloha” came from. Wayne: Well, Pa’au is from where? Daniel: Pa’au was from Tahiti. Wayne: Now, in the beginning, Kawika, Hawaiians worshipped even before Pa’au, what was the name of this god that they worshipped? Kawika: Well, what’s been made known through many chants and writings even oral history uh we could find it a lot in Auntie Melea Craver and other people who have shared the history and oral history of “‘Io”. The knowledge of the Supreme Being and in collaborating with friends of ours down in Aotearoa, NZ there are even Maori chants in other parts of the Polynesian triangle that have ancient writings, histories, chants of what is known to them as a supreme being that sits in the middle of the heavens. So it is those things that we sort of, kind of, food for thought at least brings us to the table to talk and to communicate with these people representing Polynesian cultures and remembering our roots and where we all come from and it’s been pretty amazing, the journey. Wayne: So gods, the Pele and others actually came after Pa’au after the 11th, 12th, 1300s? Wayne: ‘Cause she doesn’t show up at all till later on. Daniel: No in fact the chants of Pele talk about her traveling from Kahiki or Tahiti to Hawaii. Wayne: Um, Um. So that’s where you get Tahitian god or Tahitian religion. So when they say the Hawaiian religion of Pele and some of the other are actually Tahitian migration of a religion. Daniel: Yah, that’s when all of these start to appear. Wayne: So this one God concept of ‘Io is really not a white man’s religion then and that was something here way before a white man had ever been arrived. Wayne: Now when the missionaries arrived they brought in the knowledge of Jesus Christ as God’s Son. Did that mess them up or were they open to that at that time when the missionaries came? Daniel: Well I think that God loving the Hawaiian people He had His name, they knew Him and they worshipped Him and then this invader came in and made a false religion there that wasn’t worshipping the Creator but He always left a remnant of the priests of ‘Io. The historians say that Pa’au killed the priests of ‘Io but there were ones that passed down their knowledge in secret. And I just talked with one of the descendants of the priests of ‘Io a couple of weeks ago and it was passed down to one child in each generation called the Pono one, that knowledge, and it had to be secret otherwise they would be killed if they spread it. But there were also prophecies that came out where God was preparing the time for the missionaries to come to say “this is My return”. And before the overthrow of the Kapu system there was a prophecy that came forth that there would be a communication from Keakua Meoli, the true God. And this communication would be something different from anything that they had seen before and this communication would give them a new knowledge of Him and there was another prophecy at the time of Hewahewa (1) who was actually a descendant of Pa’au and he was the one that first overthrew the Kapu system and burned the heiau and Hewahewa also knew this prophecy where it said the islands would be unified, which Kamahameha did and then the Kapu would be broken and then that the common people would be raised up to heaven. Another prophecy there was a prophecy that Lono, the Hawaiian god of peace, would come in a new form that they would not recognize and he would come in a small black box and speak a language they did not understand and they wouldn’t recognize him. Now when the Kapu system was overthrown by the Alii before the missionaries arrived, Hewahewa was the first one to burn the heiau and he said “I always knew there is only one great god in heaven. You know I followed these, the traditions of my ancestors just because that’s the way my traditions were but I always knew there was one great god in heaven” and we find that this family did know about the creator god too, by the way. But anyway, he overthrew it and he gave another prophecy. He told the king down there by the King Kamahameha Hotel, that’s why it is called the King Kamehameha hotel because the king lived there, and he pointed to a rock in the bay there that is still there under the pier next to the King Kamehameha hotel and he said “Here, oh king the new god will come.” And they waited for the new god to come. And when the missionaries came they landed right on that rock and the first missionary out carried a black Bible box, the Bibles had to be hand printed at that time and were very valuable and they had special boxes for them so he stepped out on that rock with the black Bible box and the Kahuna were the ones that opened the box, opened the book inside, couldn’t understand and words and proclaimed “This is it, the coming of the new god and the new communication in a way that we can’t understand.” So God did confirm to them that this was His Son coming. Wayne: Not Daniel, uh David rather when some of the activists now talk they say that that’s not true that it Pele, that it’s Lono, some of the others that they talk about and Christianity is really a white man’s kind of God. You being Hawaiian, how do you feel about that, which, what they’re saying does it hold any truth at all? Kawika: I think what motivates their point of view is the history that we have experienced in the name of the Church, in the name of Christianity, per se. I don’t think it’s bad for our people to seek out their identity in what our culture really represents to us. But what I simply share to them in our experience of sharing a lot of people in different parts of the world, different countries in some of the conferences that we operate the story of mankind or the world is there for anyone to uncover. When we look at Genesis 11, because of man’s foolishness and I say their desire to create a one world government God says “I need to do something about it.” So He confused the languages and dispersed the peoples and so but at that point God says they spoke one language. But then He confused that language. For me I believe next to giving Jesus Christ to the human race I believe giving us our diversity was probably the next most beautiful thing He could have done. So we see that this dispersion of people in the earth Acts 17 tells us that God predestined and determined where these people would go, when they would rise, when they would fall and that if they seek after Him they would find Him. So if we look like Daniel mentioned in Romans there is much evidence out there and I think it’s appropriate with this show being called “Connecting Point” I think that not only what the Hawaiians but the people of the world need to understand that there’s a lot of connecting points. There’s a story about our origins and how He has left telltale signs or His DNA along the way to seek our way back to Him. So my message always to our fellow Hawaiians and the Hawaiian community here whether they be in a sovereignty movement or just in the Hawaiian community itself is if you desiring to seek to go back to the old ways then the question is really then you have to ask yourself “How far do you want to go back?” At what period of time do you feel you would be comfortable in existing in that particular time of how they ruled themselves, how they cared for each other and so that’s a big question. So I think the truth is, as we start to share this history that we’ve learn, that we’ve uncovered, that’s basically the story of cultures all over the world. God left the signs there, it’s there for us to find, we seek Him and we will find Him. And so I guess that’s the best thing I could answer that question. Wayne: Kawika, where did the Hawaiians come from? Was it from the NZ area, the Maori, and then they brought, came up the chain of islands? Kawika: I think Daniel would understand more specifically the timeline in the way they were progressively inhabited and moved about. Wayne: Because they think the migration went the other way? Daniel: Well the Mauri anyway came from Hawaii and through again Tahiti, Rorotonga and down into New Zealand and then you find the strongest evidence of ‘Io actually in Hawaii, Tahiti, Rorotonga and New Zealand. Wayne: Now where are those found … in what kind of format? Daniel: Uh, mostly in chants, you mean the knowledge of ‘Io? Wayne: That’s intriguing interesting conversation. We’re going to take a break and come back and I want to talk to you about how did we go from worshiping one God to many gods? How did that transition take place and how do we get back to the roots of what Hawaii is all about? And then we’ll want to hear one of your songs (talking to Kawika) that would be kinda neat. Well stay with us we’ll be right back here on Connecting Point as we’re talking with Daniel Kikawa and Kawika Kapiapo, as we talk about the origins of faith in Hawaii. Stay with us we’ll be right back. Wayne: Welcome back to connecting point as we talk about the origins of faith in Hawaii. Daniel, you know, what are the reasons the people went from worshipping one god, ‘Io, to a plethora of gods? What took place? Daniel: Well I think there are several factors in there. One is ‘Io himself had 27 names just like Jehovah, you know Jehovah Jirah, Jehovah Rapha, El Shadai, and each of them were an aspect of who he was and so you find some people started separating this. But I think the main thing that happened is when the priests Pa’au came and he brought all these different other gods in. And from the worship of one god you know it spread out like you say to a lot of these genealogy gods, Pele and so on, is really an aumakua she is not one of the aukua, she’s a genealogy god. So a lot of these gods began to be worshipped and so on. Now the Bible tells us to respect out ancestors and all we have to do it turn it back to respect (5) instead of worship, you know we don’t have to throw away our ancestors. Wayne: Now you know a lot of the history books talk about the gods of ancient Hawaii and its Pele and Lono and some of these. Now if what you’re saying is indeed fact why don’t we change the history books? Daniel: It’s starting to happen and you are finding a lot because so many people have come out and talked about ‘Io now, now it’s out in the open that the history books now are starting to add and talk about ‘Io. And again it’s something that was hidden and I believe again there is a spiritual battle going on for the minds of men and it’s hidden but if you went to the Bishop Museum for instance to their library and you typed in ‘Io on the computer you’d get pages of printouts. It’s there. You it’s just not well known. Just like in Japan everybody worships Amatarasu, the sun goddess emperors were descended from when they have a name of a one Creator god Ama-No-Minaka-Nushi (6) which is “the god in the glorious center of heaven. (7) The average Japanese person doesn’t know about it. But all the priests know. And so people who study Hawaiian religion, they know. And so you find it more and more and there’s much written about it, you just have to go to the right places. Wayne: So why isn’t it written up? Why is this kind of a new knowledge now? Daniel: Well I think that, again, we are bringing it back and the knowledge of ‘Io at one time, if you spoke about it meant death because Pa’au would kill you. And so it had to be secret and was passed on to one child in each generation. Wayne: So as a Kapu you don’t speak about it. Daniel: Well in the sense that it meant death for you, you know. And so that kinda continued on … (Kawika interjects: That’s Kapu, you die! Ha, ha, ha.) But anyway I talked with someone who was from a family from the priests of ‘Io that she didn’t know it ‘cause she wasn’t the Pono child. And she read Perpetuated and she went to her family and said, you know, do we know of ‘Io and they said “Yes” and she said then why didn’t you tell me and she found out she wasn’t the Pono one and she went to her sibling who was and he refused to tell her about it. You know it comes into a kind of a pride thing sometimes too. (8) But now’s the time that you know ‘Io himself is telling these different families of ‘Io that you know it’s time to let everybody know I’m the god of the Hawaiian people. Wayne: That’s good. Talking about the Kapu system was that really a religious thing in nature or was it more political? Daniel: Well the … it was really both. Now what the Mary Kawena Pukui says who wrote the Hawaiian Dictionary and so on is that Pa’au brought in the harsher aspects of the Kapu system. Now there are good Kapu. For instance the Hawaiians were the first conservationists in that sense where you couldn’t catch a certain kind of fish when it was spawning; you know things like that to make sure there’s fish there. (9) But now the harsher aspects came in like for instance again like a woman couldn’t eat a banana or she was killed. She couldn’t eat coconut you know so there’s a lot of women want to go back to the, find their roots but if they go back to this system no more coconut crème pie you know no more kulolo for them, no pork they couldn’t eat, no laulau, no and you know (Kawika chimes in: And better for us! – ha, ha, ha. … they all laugh) But you know you were saying earlier about the as we were talking earlier about Kapiolani and when she was a young girl she ate a banana, this is talking about the political how it was, so she ate a banana but because she was a high Alii she wasn’t killed. They took her favorite servant boy, a boy named Mau, and this the kahuna strangled Mau on the altar of the heiau in her place. And later on, many years later when she became a believer in Jesus and she asked this same kahuna “why did you do this?” And he said himself “those were dark times but we priests knew better all along … we did it to keep control over the minds of the people.” So that’s where the politics come in … fear and the control, and again many people want to go back to that old system but if you go back to that system, human sacrifice, and these kapu that meant death were a very important pillar in that system. You can’t go back to it without the human sacrifice coming back. Wayne: So Kawika on the sovereignty movement and going back to the old Hawaii, is that what they want to go back to … that system … the Kapu system … the penal system? Kawika: I don’t think so. I think most of them don’t fully understand what would actually happen and take and what they would be victims of. If they chose to go back to that period of time I think there a lot of, I think I mentioned earlier about what motivates a typical Hawaiian man or woman to want to seek out their roots and live in the old ways. I think there is more desire to be fulfilled or to reconcile the issue of the whole overthrown colonization issue that has happened. And I think really what they are really saying in their hearts is “just let me have it the way it used to be, you know the way we used to live” and enjoying the Aina and living with the Aina, enjoying each other’s aloha, fellowship, the music, the chants, whatever it was. I think that’s really what their saying is that to be able to have just maybe left alone or (Wayne: go back to simpler times) right, right or to justify the feelings of why the overthrow took place. And so I think really what most Hawaiians are really saying in their heart is there’s a way of life that was perfectly fine for us that we felt rich in a way that didn’t necessarily mean any kind of economic attachment to it but just feeling rich with the culture and the Aina and the land. And that’s what I really believe their saying is that I just want to go back to a simpler way of life that we understood. Wayne: And Kawika we all wish that and there are times I wish for simple times too, you know and that would be really nice but wouldn’t that require probably 90% of the population to leave so that they could have simpler times? Kawika: Right but what I think from what I understand at the time of the overthrow and the way the territory was set up then and as like any other country people could apply for citizenship. So the truth is I believe that most leaders of the movement today understand the fact that if there’s any sort of reinitiation or nation within a nation or sovereignty movement actually established or recognized I think most of the leaders now understand the fact that it’s beyond just the koko, the blood but people who have called Hawaii home for generations. Wayne: Great. Now missionaries, did they come and overthrow the Kapu system? Is that what they did or how did that get turned over? Daniel: Well again the Kapu system was overthrown in 1819 and the missionaries came in 1820. So they did not do that, it was initiated by the Li’i themselves, King Kamaheameha II and Kaopualani and Ka’ahumnu and they were the ones that initiated it. I think that what got compressed is that the missionaries made a lot of mistakes, and one of the mistakes they made was reject the Hawaiian culture, which really flows from who they are. And it’s almost like God is rejecting you. And they rejected the name of ‘Io. I talked with several families of the priesthood of ‘Io who said that they, when they heard about who Jehovah was the uncreated creator who created the first man and woman, man was sacred to Him and not to be killed and all these things they said “we know of Him” and His name is ‘Io and they were basically, everything about your culture is basically evil (10) or so to speak and so you know the Creator God. And so they basically kept it silent and within their families but they said all through that time they were p raying and saying “’Io you are Jehovah”. Wayne: So this one god and this Christian concept of god, is not really a white man’s religion brought here then it is really something that was here from the very beginning. Daniel: Yeah. And I don’t even think we can say it’s a Christian concept of God. It’s really just God’s general revelation because He loves all His children. (11) He wouldn’t leave them without a witness. It says in Acts 17 that he placed everybody where they should be so that they may reach out for Him and perhaps find Him and He is not far from anyone of us. (12) You know, in fact we live, we move, we breathe within Him. (13) You know in Hawaii especially you look at creation, if we know Him by creation, um we should have had so much communication with His people. Kawika: Uh, huh. What was interesting it that his blueprint perfectly planned mission, I guess, that led from Henry Obookiah living on the East Coast his influence on the missionaries there, his education, and the fact that he motivated those people who at one time told him “those native savages can’t be educated so how can they possibly be converted.” (15) But because of this one man just months prior to Hewahewa receiving and giving the prophecy having the dreams desecrating the heiaus what was it, six months later? The first ships arrived so God had a master plan preparing the very ones who benefited from the Kapu system Kamehameha and Hewahewa were the very ones that said we need to be open to this new thing that Akua or ‘Io is revealing to us. (See Footnote 1) Six months later the first missionary ships. A few web sites out there have obviously bought the myth of Hewahewa recounted by Daniel Kikawa (Leon Siu's pastor) in Chapter 9 of Perpetuated In Righteousness, about him being a “prophet” of God. There are also non sugar-coated versions of the end of Hewahewa. When you read another account below you will realize that Hewahewa's motivation was not unlike Simon the Sorcerer’s in the Bible, and that he was apparently never really saved. Like so many people today, pagan priests were looking for signs and wonders when they ought to have first learned to place their faith in Jesus Christ who is the only one who really does Divine miracles. The “signs and wonders” the kahuna were doing were not Divine miracles, they were “lying signs and wonders” (Mark 13:22, 2 Thes. 2:9) designed to trap (2 Tim. 2:26) people deeper into false religion. (2) In point of fact Kikawa is wrong about the migration to New Zealand coming from Hawaii. Polynesians in the South Pacific discovered the landmass of New Zealand. (http://en.wikipedia.org/wiki/Immigration_to_New_Zealand) Hawaii is in the North Pacific. According to Maori, the first explorer to reach New Zealand was Kupe. Using the stars and ocean currents as his navigational guides, he ventured across the Pacific on his waka hourua (voyaging canoe) from his ancestral Polynesian homeland of Hawaiki. It is thought that Kupe made landfall at the Hokianga Harbour in Northland, around 1000 years ago. Where is Hawaiki? You will not find Hawaiki on a map, but it is believed Maori came from an island or group of islands in Polynesia in the South Pacific Ocean. There are distinct similarities between the Maori language and culture and others of Polynesia including the Cook Islands, Hawaii, and Tahiti. ( http://www.newzealand.com/us/feature/early-settlement/) Again the earliest settlers were likely from a South Pacific island, even though the island of Hawaiki sounds like Hawaii, Hawaii is located in the North Pacific. 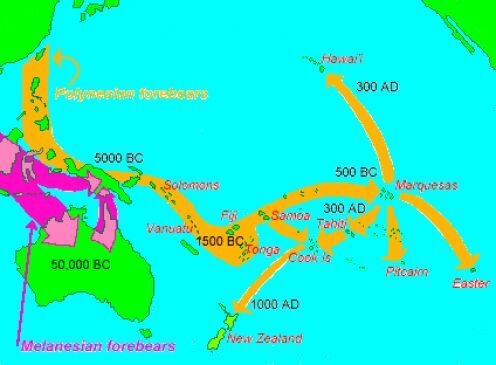 (http://pattyinglishms.hubpages.com/hub/Aborigines-New-Zealand) This migration map shows the migration to New Zealand happened in 1000AD from the area of the Cook Islands in the South Pacific. It also shows the migration to Hawaii coming from the Marquesas around 300AD. Of course the Melanesian migration dates are since the earth is not 50,000 years old but even if the dates are not correct, the direction of migration is pretty well established in archeology, language, etc. It is highly unlikely that the exact date when Polynesian people first set foot on these previously uninhabited islands will ever be known, nor much details about events occurring between that date and the first contact with Europeans ….Cook himself knew that the original Polynesian discoverers had come from the South Pacific hundreds of years before his time. First, from the Marquesas, came a settlement as early as 600 or 700 AD, and then from the Society Islands, another migration about 1100 AD. (http://www.hawaiian-roots.com/hawaiihistory.htm) Again we have confirmation that the earliest settlers came from the Marquesas, even though the dates are not certain, and not the other way around with the Maori settling New Zealand from Hawaii. The reason Kikawa wants to claim this is because he co-opted the god of the Maori, ‘Io, as being the same in Hawaii. But ‘Io was unknown in Hawaii, except for the fact that there is a hawk called ‘Io which was likely worshipped as all Pacific islanders were worshippers of animals, plants, fish, rocks, mountains (Pele) from the earliest times. This is called animism and is consistent with this type of worship of the created things all over the world. (3) The claim that heiaus were for the worship of ‘Io by Kikawa and Kawika is historically false. Many types of heiau existed, including heiau to treat the sick (heiau hōʻola), offer first fruits, offer first catch, start rain, stop rain, increase the population, ensure health of the nation, achieve success in distant voyaging, reach peace, and achieve success in war (luakini). Only the luakini was dedicated through human sacrifice. There are two types of luakini. They were called the ʻohiʻa ko and hakuʻohiʻa. … The heiau most commonly preserved are war temples of the later period of history (e.g. Pu'ukohola Heiau National Historic Site). They are composed of large stone platforms with various structures built upon them. The structures were used to house priests, sacred ceremonial drums, sacred items, and cult images representing the gods associated with that particular temple. There were also altars (Ahu) on which to offer sacrifices (plant, animal and human). The heiau were sacred places; only the kahuna (priests) and certain sacred ali'i (high chiefs) were allowed to enter. The largest heiau currently known to exist, Hale O Pi'ilani Heiau, is a massive, three-acre platform with fifty foot retaining walls located in Hāna on Maui. Built for Pi'ilani, it dates back to the 13th century. Agricultural heiau, called generally Hale-o-Lono for the god of fertility, can be found today on Oʻahu at Makaha (Kaneaki heiau - fully restored) and in Hawaii Kai (Pahua heiau - partially restored). The Kaneaki heiau was built in the 17th century, containing grass and thatched huts that were chambers used for prayer and meditation. The ruins of a healing heiau, Keaiwa ("the mysterious") are located at the entrance to Keaiwa State Park in ʻAiea. No mention on the aforementioned site of ‘Io either, only the “major Hawaiian gods”. The following site is a site that has bought into the Kikawa paradigm, mentioning ‘Io, but the historic Hawaiian gods are generally agreed upon in most literature which are Kanaloa, Kapo, Ku, Kane, Hina, Lono, Laka, Papa, Honua and Pele. (5) When the Bible tells followers of God to respect their ancestors, it is not saying to worship them or their false gods. Only if they were worshipping the true God do they deserve respect. The early ancestors of the Hawaiians were not worshipping the true God, even if they were worshipping ‘Io as a supreme being, which he was not in Hawaii. The Bible is clear from beginning to end that we are to worship God in His name. His name is YHWH (I Am That I Am) and also referred to as Elohim, Adonai, etc. God is never referred to in the Bible as Baal, Marduk, Aman or any of the other false gods of the nations. Deuteronomy 6:13 Fear the Lord your God, serve him only and take your oaths in his name. Zechariah 10:12 I will strengthen them in the Lord and in his name they will live securely,” declares the Lord. Luke 24:47 and repentance for the forgiveness of sins will be preached in his name to all nations, beginning at Jerusalem. There is a reason why the Bible repeats many times, above which are only a few examples, that those who follow YHWH and Jesus Christ, His Son must do so “in His name”. The reason is that His name distinguishes Him from any other wannabe “god” like Kikawa’s ‘Io. No other god of the nations is the self-existent One, YHWH, from eternity past to eternity future. No other Gentile nation knew God by name and unless they were introduced to Him in the Old Testament by a Jew or the New Testament by a Christian, they “do not know God.” They may know there is a Creator if they look at nature, but they cannot have a personal relationship to the Father, Son or Holy Spirit. (6) Kikawa has also been producing materials to try to convince Japanese Christians, in particular, to worship the god he claims is their true god, Amenomenakanshi. Kikawa even went so far as to apologize to the Japanese for the missionaries who came and told them about a “foreign god” when they already were worshipping the true god. See my new article on the issue of WCGIP adherents blaming missionaries for bring a foreign god to the Gentile nations here. The problem is that this god is one of a pantheon of “kami” and spawned by other gods going back to the original two gods, male and female, Izanagi, sky-father creator deity. Izanami, earth-mother creator deity. (http://www.deceptioninthechurch.com/blasphemizingthebible.html) Why Kikawa failed to present this fact in his DVD series called “Fingerprints of God in Japan” is beyond me. A “god” spawned by a male and female “deity” couple does not make for a very good candidate to replace YHWH who is self-existent. The reason he did not choose Izanagi is because he would have been saddled with the oldest of false religion, that of one male and one female deity spawning other lesser gods. By the way, this type of religion is EXACTLY why those who went out from Babel did not carry the knowledge of the true God with them but rather the worship of Nimrod and Semiramis as the “sun and moon” which is why they built a ziggurat so that couple could be closer to the sky they were allegedly a part of. This false religion, halted by God at Babel by confusing their tongues, they took with them and virtually every ancient religion in the world is based on a male and female deity. There are actually three creators gods in Japanese mythology: Amanominakanushi no Kami, Takamimusuhi no Kami & Kamimusuhi no Kami ( http://ilmainensanakirja.fi/sanakirja_englanti-englanti/the+three+creator+gods+%28Amanominakanushi+no+Kami,+Takamimusuhi+no+Kami+%26+Kamimusuhi+no+Kami%29) This is not a “trinity” but three separate gods. Therefore Ama-No-Minaka-Nushi cannot be the true God of the Bible by Biblical definition. He was acknowledged as one of the zōka sanshin ("three kami of creation") and one of the five kotoamatsukami ("separate heavenly deities"). (http://en.wikipedia.org/wiki/Amenominakanushi) Not only one of three gods which Kikawa mentions, but also as one of five gods. Again, not the God of the Bible. For the Japanese creation myth, that bears no real resemblance to the Biblical account go here. Here are a couple of highlights from that article that prove this myth has nothing to do with the Biblical God: (1) The heavens are said to have come into existence before Ama-No-Minaka-Nushi, who Kikawa claims is the same as YHWH (2) Two other deities were then formed and helped Ama-No-Minaka-Nushi create the universe. YHWH is One God eternally existing in three Persons, not three gods. (3) It is said the earth took millions and millions of years to form as opposed to the six literal days of Creation in the Bible. (4) Many gods then sprung up while the earth was forming. (4) Izanagi and Izanami gave birth to all the various “kami”. (5) Izanami then died. (6) Izanagi tried to save her from Hades and she got mad at him for seeing her rotting corpse and sent a female demonic horde after him in retaliation. Oh yes, this is all very Biblical indeed (sarcasm!). (8) Auntie Melea Craver is one of the only living “authorities” where Kikawa got his ideas of ‘Io. But it is clear that she knew nothing about ‘Io till she read Kikawa’s book so she would not be a legitimate contributor to the book of any historical fact. I believe Melea made up a number of things after the fact because of Kikawa’s account that the “pono” member of her family would not tell her anything about ‘Io. We see virtually no evidence of a god named ‘Io in Hawaii prior to Kikawa’s book and it looks like he made it up from whole cloth. He takes some anthropologist’s writings out of context that talk about an ‘Io, a god of the Maori. That “god” was made up after exposure to Christianity in order to try to keep the Maori from abandoning their old religion. Kikawa even made up quotes that were not in books by people he cited in “Perpetuated” and we know because we looked for them and could not find them. So he got some of his information from modern Hawaiians who are telling tales to their liking and for the benefit of making their culture seem “godly”. This is not what the true God would say about bones. There is no spiritual essence in dust. Craver is still very much involved in Hawaiian religion, namely dances to Pele. There is a hula competition in her name every year called the Malia Craver Hula Kahiko Competition. (9) Ocean conservation was not originated by Hawaiians. It is something we see in many island groups, some of which were settled earlier than Hawaii. Bans on catching certain fish or certain sizes due to leaving them to grow as well as conservation of certain areas where people were not allowed to fish are in many places in the North and South Pacific. (10) The Congregationalist missionaries did not reject everything about the Hawaiian culture or call everything about their culture “evil”. They rejected their false religion and cultural activities tied to it. Not only that, but the first generation of converts also rejected their former religion and cultural practices associated with it, including hula which was a dance dedicated to Pele. Also the story Kikawa tells of talking to families of alleged “priests of ‘Io” could not be true because of what Kikawa said earlier about Auntie Melea Craver saying she could not even get information from her “pono” relative, the last surviving “priest” about ‘Io. So anyone else he talked to was making up stories out of whole cloth. (11) A concept of God without being a follower of Christ (Christian) or a Jew in the Old Testament would have no value because there was no specific revelation that would be salvific. It would simply be the idea that there must be a Creator, but without the name of God, without the Son of God, and without the Spirit of God who reveals all truth about God (John 16:13) from the written Word (Eph. 6:17). There is no way to know anything more that that there was a Creator at some point without the indwelling Holy Spirit Who can only be given when a person believes on the Lord Jesus Christ for salvation and is born again. Acts 12:22-34 Paul then stood up in the meeting of the Areopagus and said: “People of Athens! I see that in every way you are very religious. For as I walked around and looked carefully at your objects of worship, I even found an altar with this inscription: to an unknown god. So you are ignorant of the very thing you worship—and this is what I am going to proclaim to you. “The God who made the world and everything in it is the Lord of heaven and earth and does not live in temples built by human hands. And he is not served by human hands, as if he needed anything. Rather, he himself gives everyone life and breath and everything else. From one man he made all the nations, that they should inhabit the whole earth; and he marked out their appointed times in history and the boundaries of their lands. God did this so that they would seek him and perhaps reach out for him and find him, though he is not far from any one of us. ‘For in him we live and move and have our being.’ As some of your own poets have said, ‘We are his offspring.’ “Therefore since we are God’s offspring, we should not think that the divine being is like gold or silver or stone—an image made by human design and skill. In the past God overlooked such ignorance, but now he commands all people everywhere to repent. For he has set a day when he will judge the world with justice by the man he has appointed. He has given proof of this to everyone by raising him from the dead.” When they heard about the resurrection of the dead, some of them sneered, but others said, “We want to hear you again on this subject.” At that, Paul left the Council. 34 Some of the people became followers of Paul and believed. Among them was Dionysius, a member of the Areopagus, also a woman named Damaris, and a number of others. The writer of Acts, Luke, was quoting from the Old Testament. We can understand the context of Acts 17:26 by reading Deut. 32:7-11. God was setting the boundaries for the nations according to the children of Israel so that the Gentile nations would end up in proximity to Israel and thus possibly come to know the God of Israel. It was not that God was creating nations and giving them “promised lands”. He was going to spread Israel out among the nations as a witness from the establishment of Israel till the incarnation of Jesus Christ. After Jesus Christ the message of the Gospel would be spread through Jews and Gentiles who had come to understand and believe in the mystery of the Gospel. As I covered in a previous article, Paul did preach the Gospel in terms that the Greeks could understand. He used the illustration of the “unknown god” which they were worshipping, with some sarcasm as scholars note, to point out that they did NOT know the true God at all, not to bridge a “gap” between them and their worship of an “unknown god”. Acts 17:23 For as I walked around and looked carefully at your objects of worship, I even found an altar with this inscription: TO AN UNKNOWN GOD. Now what you worship as something unknown I am going to proclaim to you. Another problem with Lehmann's analysis of this passage, out of context, is that most of the Greeks rejected the true God Paul was preaching because they did not believe in a resurrection. Acts 17:32-18:1 When they heard about the resurrection of the dead, some of them sneered, but others said, "We want to hear you again on this subject." At that, Paul left the Council. A few men became followers of Paul and believed. Among them was Dionysius, a member of the Areopagus, also a woman named Damaris, and a number of others. After this, Paul left Athens and went to Corinth. 1 Corinthians 2:2 For I resolved to know nothing while I was with you except Jesus Christ and him crucified. Acts 17:30-31 In the past God overlooked such ignorance, but now he commands all people everywhere to repent. For he has set a day when he will judge the world with justice by the man he has appointed. He has given proof of this to all men by raising him from the dead." This verse goes to the heart of the error of the IPM. Those who lead others to be unrepentant about their traditions of men, their lifestyles, and even their worship of other “supreme beings” are in DIRECT opposition to the clear command of God for “all people everywhere to repent”. (13) The reference in Acts 17 about ‘For in him we live and move and have our being’ is talking about the fact that we have life because of the Creator, not that we have a relationship to Him as Sons. Kikawa is claiming much more than what this verse is addressing. (14) Wayne Cordeiro affirms everything Aloha Ke Akua is teaching about these issues including the statement that God was already being worshipped and was known in Hawaii before the missionaries even came … when, in fact, Wayne has forgotten to read his Bible. (15) There is nothing in the book written about Henry Obookiah that says the missionaries stated about the Hawaiians that “those native savages can’t be educated so how can they possibly be converted.” This is another in a long line of put downs of missionaries that has no basis in fact by WCGIP adherents. The fact is that the Congregationalists listened to Obookiah tell of just how much darkness there was in Hawaii and in the Hawaiian religious system, since Obookiah was previously studying to be a priest, and they were convicted that the Gospel needed to be carried to Hawaii. There is also no mention of any god by the name of ‘Io in Obookiah’s book either. I have an article I wrote on Obookiah proving WCGIP people like Kikawa are way off in their mythology of both Hawaii and the missionaries. (16) Cordeiro states that Kikawa is a “respected scholar” and at the end wishes them the very best as “we continue to educate people of the true origins of faith in Hawaii.” Frankly some of the worst scholarship I have ever run into, apart from the Transformations films by George Otis, Jr., are the books and materials put out by Kikawa. Cordeiro is stating that they will work together to educate people of the true origins of faith in Hawaii when Kikawa’s claims are, by in large, fraudulent. This kind of information, along with a whole host of other false teachings, are being passed along in Cordeiro’s churches and schools as well as in the World Christian Gathering on Indigenous People conferences.